After three consecutive birdies (by both players) on the first three playoff holes, Canadian Tour Professional Ryan Williams outlasted VGT’s Matt Makinson by making a fourth consecutive birdie to take the title as Champion of the 2010 Golden Ear’s Invitational. Williams certainly showed everyone this year that he is a force to be reckoned with on the Canadian Tour with his play on Sunday, birdying five holes in a row on the back nine to get him into contention and eventually win the event. His two day total of 69, 68 (-7) earned him a cheque for $2,200 and edged him up to 3rd place on the CLEVELAND/SRIXON Order of Merit with 6,875 points for the year after playing in 9 of 14 VGT events. Williams sits behind 2nd place Phil Jonas (8,600 pts) and 1st Place Bryn Parry (13,433) with only two events to decide who will win the coveted $5,000 U.S. PGA Tour Qualifying School entry. Williams has had his share of good rounds this year out on the Canadian Tour, and commented after his round about his 2010 Can Tour campaign: “I’m very close to breaking through this year. I seem to be putting somewhere between 2 to 3 ½ good rounds together out on tour, but need to finish the job off with some sharper play for that 4th round or back nine that’s been a bit off”. “This win certainly helps my confidence going forward to the next few events on the Can Tour schedule”. The 29-year old from Surrey, BC will head back out on the Canadian Tour starting Aug.9th, starting with the Clublink Jane Rogers Championship in Halton Hills, Ontario, followed by the Seaforth County Classic and the final Major of their season, the Canadian Tour Championship. Williams also has his sights further down the road this fall where he will make a run for the 2010 Vancouver Open Title in September (www.vancouveropen.ca) and then make a trip down to the ’10 PGA Tour Qualifying School in October. 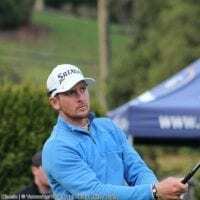 VGT Order of Merit Leader Bryn Parry’s run for back-to-back wins on the Vancouver Golf Tour schedule was cut short when he went to clean up a 2-footer for par on the 17th and lipped out. When his drive found the trees on the 18th, Parry was forced to attempt a hole-out to get to -7 and into the playoff, and although his pitch mark was only a foot away from the hole, he would eventually settle for a tie for 3rd place with McCleery’s James Harper at minus five. Parry and Harper each collected $1,000 for their t3rd place finish and Makinson’s 2nd place showing earned him $1,500 for the weekend and moved him into 5th place on the CLEVELAND/SRIXON Order of Merit. In the amateur side of the tournament it was VGT Member Kris Yardley who came a whisker away from making it into the playoff for Overall Winner when his eagle try on the 18th burned the edge of the hole. His two day total of 66, 72 (-6) was still good enough for a 3-shot victory over Langley’s Jordan Rosenlund who fired 69, 72 for the tournament. In the overall Net Division, Bentley Taylor took home Low Net honours after a three hole playoff with Cuong Pham. All 216 golfers were treated to some fantastic weather, exceptional golf conditions and spectacular food and hospitality at this year’s Golden Ear’s Invitational event. The Golden Ear’s Invitational is one of the most organized and well run Open Golf Tournaments in all of BC, so congratulations to Frank Hoadley (Tournament Executive), Steve Chapman (Tournament Executive), Neil Roberts (Head Professional), Dave Zeiler (Superintendant) and the whole team of management, volunteers and sponsors for making the 2010 Golden Ears a tremendous success! For a complete list of Professional and Amateur results from this year’s event, please visit the Pitt Meadows Golf Course website. For a detailed look at hole-by-hole scores of the event, click here then on Golden Ear’s Invitational.